The following guest post was written by Father Noah Carter, a priest of the Diocese of Charlotte, North Carolina. Fr. Carter is currently in Rome completing his studies for his Licentiate in Sacred Theology (STL) with a focus on Liturgical Studies. Since the publication of the Constitution on the Sacred Liturgy Sacrosanctum Concilium by the Second Vatican Council, the Catholic Church has continued to experience liturgical diversity which ranges from legitimate variety to outright abuse. More particularly, music used in the liturgy has since varied in form, style, and genre, and the previous forms of sacred music composed for the liturgy have fallen widely into disuse, especially in parishes. After many decades which have seen an analysis of the Conciliar documents, however, the Church’s will in the direction of the liturgy has been seen to concur with the same direction that existed before the Council spoke on the issue of her different forms of worship. It will be shown below what paragraph 116 of Sacrosanctum Concilium means by giving Gregorian chant “principium locus” through an examination of the pre-Conciliar magisterial texts concerning sacred music and then the post-Conciliar magisterial texts concerning the use of music in the liturgy. “The Church acknowledges Gregorian chant as specially suited to the Roman liturgy: therefore, other things being equal, it should be given pride of place (principem locum obtineat) in liturgical services. But other kinds of sacred music, especially polyphony, are by no means excluded from liturgical celebrations, so long as they accord with the spirit of the liturgical action…”. The translation provided above is the official English translation given by the Vatican. The first part could be rendered into English more accurately as, “The Church recognizes Gregorian chant as characteristic of the Roman liturgy: therefore, in liturgical celebrations, other things being equal, it is to hold first place.” With this more literal rendering of the passage, one can see the obvious force carried by the original Latin text. There are a few particular Latin words and phrases which are noteworthy. The word proprium evidences an intrinsic connection between Roman-Gregorian chant and Roman liturgy. Also, the present subjunctive (obtineat) is used in statements to assert a desired ideal. Lastly, and most importantly for the present study, principem locum is not just a special or fair place, but the first place. Just as the principes (literally, “first citizen”) in Rome was the leader of the people and all looked to him for guidance, so Gregorian chant is the leader of sacred music from which principles are formed to govern the sacred arts. The phrase principem locum does not introduce a novelty to the Church’s liturgical tradition. Gregorian chant was born from the Roman liturgy and will always be fitting to the Roman liturgy (liturgiae romanae proprium). During liturgical services, then, Gregorian chant should be the first choice for the principal parts of the liturgy, if this is possible and does not detract from the congregation’s participation (ceteris paribus). The second part of the paragraph continues the Church’s allowance of other types of sacred music—as long as it is liturgical—to ornament the liturgy. To understand the paragraph better, it is necessary to show the notions which were laid down before the Council concerning Gregorian chant, notions which give content to the phrase principium locus. While the document’s treatment of the place of Gregorian chant in the liturgy is brief, the gravity of the paragraph is not miniscule. No more need have been said in Sacrosanctum Concilium concerning the first place of the Roman Church’s chant, since other magisterial texts had already established and gave reasons for its first place among forms of liturgical music. According to Pius X, then, Gregorian chant—and indeed all music considered sacred and used in the liturgy—shares in the same ends as the sacred liturgy and, ornamenting the sacred texts so that they are more easily understood by the faithful, moves all to greater devotion and piety. He proffers the general principles which should guide the selection and composition of sacred music, “La musica sacra deve per conseguenza possedere nel grado migliore le qualità che sono proprie della liturgia, e precisamente la santità e la bontà delle forme, onde sorge spontaneo l’altro suo carattere, che è l’universalità. Holiness, excellence of forms, and universality are the qualities which will guide the magisterial teaching on sacred music until the present day. According to William Mahrt, this Motu proprio provides the seminal ideas necessary to reestablish “the intimate relation of music and liturgy in Gregorian chant….” Indeed the future statements by popes and bishops in pastoral instructions and letters return constantly to Pius X’s description of sacred music. Gregorian chant, then, does not belong to the priest or the schola cantorum alone, but to all those who participate in the liturgy. It was born from the Roman Church’s celebration of the sacred mysteries and evolved with the rites themselves throughout history. It fosters the participation of all and, therefore, aides the devotion and sanctification of all. Gregorian chant is universal in time and place as it ornaments the universal texts and prayers of the Church. And if in Catholic churches throughout the entire world Gregorian chant sounds forth without corruption or diminution, the chant itself, like the sacred Roman liturgy, will have a characteristic of universality, so that the faithful, wherever they may be, will hear music that is familiar to them and a part of their own home. In this way they may experience, with much spiritual consolation, the wonderful unity of the Church. This is one of the most important reasons why the Church so greatly desires that the Gregorian chant traditionally associated with the Latin words of the sacred liturgy be used. With these words, he has highlighted the one-to-one correspondence between the Roman liturgy and the Roman chants. From an historical point of view, he has well established what the papal texts had been teaching for over five decades, namely that Gregorian chant is the standard upon which the guiding principles are founded for other types of sacred music. Therefore, since the Church had been clear about the first place of Gregorian chant in liturgy, the Council Fathers found no need to elaborate further once they expressed that Gregorian chant should be given first place in worship. It cannot be denied that the exterior celebration of the Church’s worship changed quite dramatically after the Council. Much change may be attributed to the reform of liturgical books, and some can be attributed to the illicit introduction of cultural characteristics which do not agree with the Church’s liturgical spirit. In terms of the present study, many celebrations saw the introduction of secular music, rather than a continuation of the sacred music of ages past. The Church, as it will be shown, continued to teach the same message regarding the use of Gregorian chant and true sacred music in her celebrations. She continued defending—both in word as well as in deed—the primacy of Gregorian chant’s place in the liturgy, despite decades of objections. We see, then, that members of the Church’s hierarchy continued to confront the baseless objections that Gregorian chant is no longer suitable for the faithful of this age. The “other things” are the situations in all the churches: the ability of the faithful, the training of the clerics, and the expertise of the choir. In other words, all things would be equal if all the standards laid out by the Second Vatican Council were met by those entrusted with sacred music, the formation of the clergy and faithful, and the care of souls. As Poterack signals, though, there are some cases in which the introduction of Gregorian chant would be a burden and, therefore, not assist the faithful’s participation. In a word, the Second Vatican Council dedicated a whole instruction to sacred music. What the Fathers did not expound upon in Sacrosanctum Concilium’s paragraph 116 was further explained in the Instruction on Music in the Sacred Liturgy Musicam Sacram. “Above all, the study and practice of Gregorian chant is to be promoted, because, with its special characteristics, it is a basis of great importance for the development of sacred music. This Instruction, therefore, calls not only for the study of Gregorian chant, but its implementation in the sacred liturgy so that it may aide the faithful. The pontiff clearly communicates that Gregorian chant cannot be locked in history as proper to a certain century or period. For all times and all peoples, Gregorian chant unifies the Church because it is characteristically universal. “The typical edition of the books of Gregorian chant is to be completed; and a more critical edition is to be prepared of those books already published since the restoration by St. Pius X. The first part of the above-quoted paragraph orders the continuation of a project already underway at the time of the Council’s proceedings. The Council Fathers wanted a more thorough study of the compositional principles behind the development of Roman chant. This project did continue—thanks to the diligent work of the Benedictine Monastery of Solemnes—and finished with two new and revised editions of the Roman Gradual. The second part is of particular noteworthiness. After calling for Gregorian chant’s first place in the liturgy, when other conditions are equal, the Council orders simpler melodies for smaller churches—that is, those churches which do not have conditions that are equal with the large parishes, cathedrals, collegiate churches, oratories, etc. That is, the Church desires that even in the places that cannot support the technique needed to sing the traditional Gregorian melodies, Gregorian melodies and techniques are used in singing the sacred texts of the Church’s liturgy. From this reform decree, the Graduale Simplex was drawn up under the inspiration of Gregorian modes and melodies for use in smaller churches that cannot sustain a full repertoire of the traditional Gregorian chants. These actions undertaken by the Church show forth her will in conserving the primacy of Gregorian chant’s place in the liturgy. During John Paul’s pontificate, Joseph Cardinal Ratzinger carried on the same promotion of sacred music. He wrote in support of John Paul’s push for sacred music and Gregorian chant in the liturgy. Upon his election to the Roman cathedra, he continued to promote and encourage the use of chant and polyphony in liturgical celebrations. With this in mind, principium locus has always meant “first place” and is practically understood to mean that Gregorian chant should be the first choice when selecting musical settings for individual liturgical celebrations. While the Church has always valued Gregorian chant as the ideal form of music for the sacred liturgy, this point has been explicitly repeated for more than 100 years by the Roman pontiffs, especially in light of Pius X’s push in 1903 to make sacred music a priority in the Church. 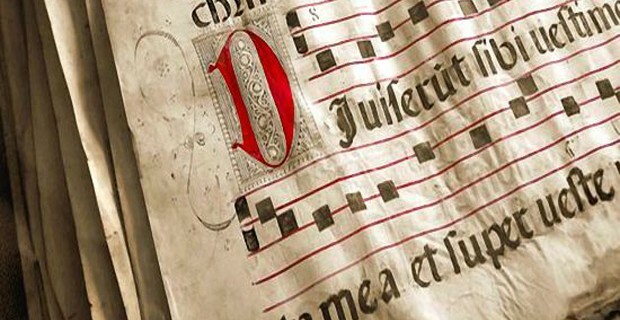 Moreover, recent scholarship and studies—some of which have been cited above—show that the Church still views Gregorian chant as the most ideal form and most appropriate for the Roman liturgy. Paragraph 116 of Sacrosanctum Concilium may be quite succinct, but it contains a rich content of anterior magisterial texts and looks forward to further explanation by the Magisterium, which have been offered by the post-Conciliar pontiffs. Through the above exposition of the scholarship and magisterial texts, one can easily see that the Church never abandoned her rule that Gregorian chant is to be taught to all members of the Church, especially the clergy so they may teach their flocks, and used as the first choice when planning a celebration of the Roman liturgy. Looking toward the future, one may hope that pastors of souls continue to implement the will of the Church in the liturgy by using Gregorian chant and sacred music inspired by the Gregorian tradition. Pius X, “Motu proprio de restauratione musicae sacrae Tra le sollecitudini,” in Acta Sanctæ Sedis, vol. 36 (Rome: S. Congr. de Propaganda Fide, 1903), 332. William Mahrt, “Gregorian Chant as a Paradigm of Sacred Music,” Sacred Music 133, no. 1 (Spring 2006): 5–14. Pius XII, “Encyclical Letter on Sacred Liturgy Mediator Dei et Hominum,” November 20, 1947, para. 191. Pius XII, “Encyclical Letter on Sacred Music Musicæ Sacræ,” December 25, 1955, para. 42. Francis Arinze, “Address of His Eminence Francis Cardinal Arinze” (presented at the Gateway Liturgical Conference, St. Louis: Libreria Editrice Vaticana, 2006). Kurt Poterack, “Vatican II and Sacred Music,” Sacred Music 125, no. 4 (Winter 1988): 5–19. Second Vatican Council, “Instruction on Sacred Music Musicam Sacram” (Libreria Editrice Vaticana, March 5, 1967), para. 4b. Mark Daniel Kirby argues that this broadened definition is lamentable since it allows the introduction of musical forms that have not previously been considered sacred; more specifically, it allows liturgical music that is not sacred art since it does not accord with all the characteristics that the Church has always held as principles. He argues that the definition provided by Musicam Sacram “reflects a compromise between two opposing factions: those who, holding to the ‘ministerial function’ of sacred music advanced in the Constitution on the Sacred Liturgy, sought to foster the collective participation of the assembly in the sung liturgy; and those who, defending sacred music as ‘art,’ feared, above all, the loss of the treasured repertoire of the Roman Cappelle.” See his article: “Toward a Definition of Liturgical Chant,” Sacred Music 136, no. 2 (Summer 2009): 5–39. Second Vatican Council, “Musicam Sacram,” para. 52–53. John Paul II, “Chirograph for the Centenary of the Motu Proprio Tra Le Sollecitudini on Sacred Music” (Libreria Editrice Vaticana, November 22, 2003), para. 7. Second Vatican Council, “Sacrosanctum Concilium,” 117. Graduale sacrosanctæ romanæ ecclesiæ de tempore & de sanctis primum sancti Pii X iussu restitutum & editum, Pauli VI pontificism maximi cura nunc recognitium, ad exemplar «ordinis cantus missæ» dispositum, & rhythmicis signis a solesmensibus monachis diligenter ornatum (Paris­-Tournai: Abbaye Saint­Pierre de Solesmes & Desclée, 1974); Graduale Triplex, Seu Graduale Romanum Pauli PP. VI Cura Recognitum & Rhythmicis Signis a Solesmensibus Monachis Ornatum Neumis Laudunensibus (cod. 239) et Sangallensibus (codicum San Gallensis 359 et Einsidlensis 121) Nunc Auctum (Paris­-Tournai: Abbaye Saint­Pierre de Solesmes & Desclée, 1979). Graduale Simplex in usum minorum ecclesiarum, editio typica altera (Rome: Libreria Editrice Vaticana, 1975). John Paul II, “Chirograph for the Centenary of the Motu Proprio Tra Le Sollecitudini on Sacred Music,” para. 3. Cf. Josef Ratzinger, “Liturgy and Church Music,” Sacred Music 112, no. 4 (Winter 1985): 13–22. Benedict XVI, “Post-Synodal Apostolic Exhortation on the Eucharist Sacramentum Caritatis” (Libreria Editrice Vaticana, February 22, 2007), para. 42. Posted on September 20, 2016, in liturgy and tagged chant, Gregory Chant, music, Pope St. Pius X, sacred music, second vatican council, song. Bookmark the permalink. 5 Comments. I’ve loved Gregorian Chant since my childhood. Learning Latin later increased my appreciation of the art form and the style which arose from Solemnes Abbey in France. The other day one of my daughters asked me what the language of the Chant was and was surprised that it is Latin. Listening to it, she thought it was Greek. For her the melodies of the chant are beautiful but she doesn’t understand the text. Something like a person who doesn’t understand Italian loving the operas of Bellini. Wonderful comment Franklin. Thank you! What exactly are defining characteristics of Gregorian chant? As far as I know, it consists of an antiphon sung by all followed by verses (usually of a Psalm) sung by the schola or cantor. Is there more criteria?